Place a large pot (I use my new copper one!) over medium heat. Pour milk, vanilla, sugar and baking soda, give it a good stir and let it come to a simmer. Keep it at a steady medium simmer for about one hour and a half, stirring occasionally, every 15 to 20 minutes or so, with a wooden spatula or spoon. The mix will gradually thicken and darken. You know the cajeta is ready when: It achieves a caramel brown color; it is thick as liquid caramel or syrup, much like a chocolate syrup consistency; it envelops the back of the spoon; when you gently stir across the pot with your wooden spoon, a slightly delayed trail behind the spoon appears, revealing the bottom of the pot if only for a few seconds; as you slowly lift up the wooden spoon or spatula, cajeta takes it’s time to drop and lastly, the sides of the pot show how the cajeta has cooked down and if you run your spoon across that side, you get a fudgy (and delicious) residue. To make homemade cajeta, I boil a can of condensed milk in a saucepan of water an hour on one side and then turn it over and boil it another hour on the other side. 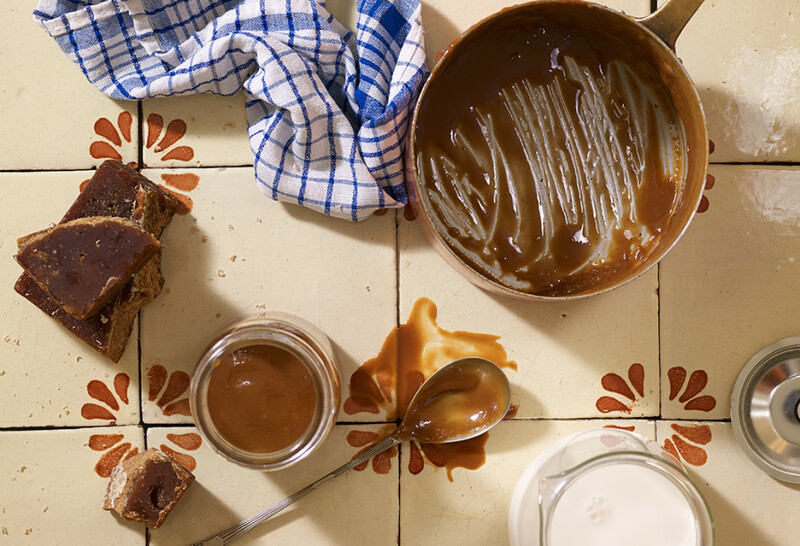 Open the can and enjoy homemade cajeta! You mentioned another way to make this with sweetened condensed milk. May we have this recipe? Thank you! My family watches all of your cooking shows, we love you and the boys! Last night, we watched you make Dulce de Leche Cinnamon Rolls and I woke up this morning wanting to try the recipe. I also decided to make dulce de leche versus buying it and it is delicious, so MUCH better than bought! I did not have dark brown sugar on hand, so I used light brown sugar with a bit of molasses. The dulce de leche turned out perfectly, thank you! During the cooking process, I mixed a few tablespoons of the liquid gold into a hot cup of Cafe Bustello and it was the best cup of coffee I’ve had in years. So happy to hear this DeeDee…and yes coffee with a bit of cajeta…AMAZING!!! I have just purchased two of your cookbooks, Mexican Today and Pati’s Mexican Table. I am very excited to start my Mexican food journey, but am disappointed that the Cajeta recipe is not found in either book? I am however glad that I was able to find it here! Tonight we will have Homemade Corn Tortillas with Fast-Track Chicken Pibil, Plantain and Refried Bean Quesadillas. Last time we were in Los Cabos I had mole poblano and was hooked! I am hoping your recipe for Tablecloth-Stainer Chicken in Red Mole Sauce will be similar? Hi Pati, my pot was too small and the mixture boiled over within the first 20 minutes. I continued cooking it, but it’s been about 3.5 hours now and it’s still not thick, but has reduced. Is there a way to salvage it, or is it messed up because maybe too much sugar boiled over? Thank you. Oh no… not to worry though. You have made the right product which is a milk based caramel. Whereas thicker ones thinner it will be yummy anyway! Thank you Pati, you were correct. I tried again with dark brown sugar and it worked beautifully. It is really unbelievable. I wanted to make it to use in recipes (your upside down flan cake, cinnamon rolls…) but I think that I will use it all up drizzling it on my oatmeal or plain yogurt – both of which are amazing. Saw you and JuJu on The Chew yesterday – you are so full of life and fun. Thank you for your help. I’m so glad it worked out! Thank you for tuning in! Hi Patti – I love your show and I love learning how to cook authentic Mexican. So thank you for teaching us. My family loves everything of yours that I’ve made. As a mom of 4 boys, I love when your boys join you in the kitchen – I can see how much they care for you. I have attempted making cajeta a number of times but it keeps curdling or something that looks like curdling. I am using goats’ milk from Whole Foods that is fresh. I wonder if the problem is the sugar. I live in the Northeast and Mexican ingredients are hard to find, but I do want to cook as authentically as possible. I did find a cane sugar called Panela which I thought was the same as piloncello. After grating, I wasn’t sure if it should be packed when measuring it. Maybe my quantity is wrong. For 8 cups of milk, I use 1 pound of panela. It seems like the baking soda could be reacting with the panela to cause the curdling because during one attempt, I added it later (mixed with a little reserved milk)(trying to figure out the problem) and it seized up at that point. Any thoughts? That is interesting. I suggest you make it with the same goat’s milk but use dark brown sugar instead. It shouldn’t curdle. Make sure you cook it at a steady medium-medium low simmer… All my best to you and your 4 boys… I always thought that we would have 4 boys… and then… we stopped at 3! Patti – I just watched this episode on CreateTV (Sun., Aug. 30) and I thought your nephew(?) said it had salt in the dulce de leche, however, I don’t see any salt measurement in the recipe. Hi Debbie, no salt. Hope you enjoy it when you make it as much as we do.